When I started, the dessert was the only thing I’d settled on beforehand, so when I finally had a menu I felt better. I threw the pork chops together the night before and let them settle in the fridge. When I got home the night of, I let the dog out, changed clothes and went straight to cooking. The brulee was first, since I figured it would have time to set properly while I cooked and we ate. It ended up taking longer than I remembered, probably because I forgot to split the recipe. I ended up making four of them (which wasn’t a bad thing), which kind of threw me off because I don’t have multiple glass dishes for bain-maries. I ended up baking two of them in my usual 9″ square glass dish, and the other two in a 9″ non-stick loaf pan. I was hoping for the best with the loaf pan, because it was the only option I had. It worked, but I won’t be trying it again without having a knife at my throat. The brulees didn’t set as quickly as they were supposed to, but that might’ve also been because of my oven (which I am thrilled to no longer be using, the temperamental thing). In any case, by the time I got the brulees in the oven, it was probably too late to really start the bread, but being hardheaded, I did it anyway. I got it all mixed up and let it sit, covered, on the stovetop. I greased up my potatoes with olive oil, pierced the skins and threw them in the oven on the top rack to do their thing. I don’t like to waste foil or anything like that on veggies; I should’ve left it off the corn and done the same thing I’d done with the corn. All said and done, I enjoyed cooking the supper for him. 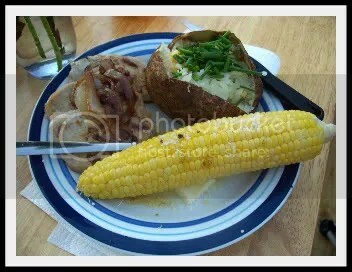 He was pleasantly surprised with the tang and heat of the pork chops, and he liked fixing his potato as he pleased. The potatoes were probably my second-rated pride of the supper, preceded only by the brulees. They were soft and fluffy after sitting in the oven for an hour or so, and perfect. I like hot fluffy potatoes. 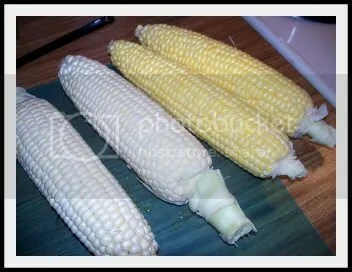 Corn before being foil-wrapped and buttered. It was good-looking, for grocery corn. 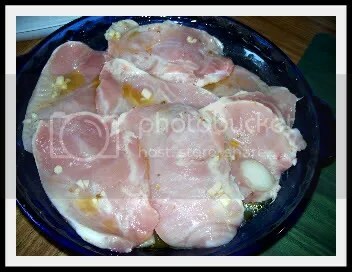 Pork chops still sitting in olive oil-lime-cayenne-garlic marinade. 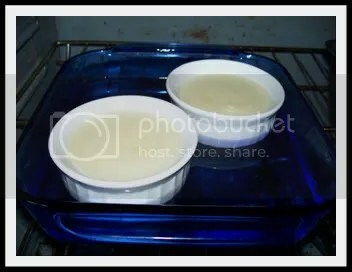 Creme brulee, in the oven and halfway through the baking process. A plated meal, ready to be consumed. The tablescape, waiting for us to sit down and eat. He brought flowers. They smelled delightful. 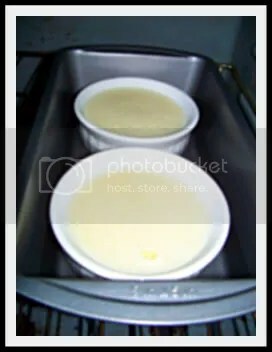 The finished brulee, before going into the fridge to set more completely. Man, they were tasty. 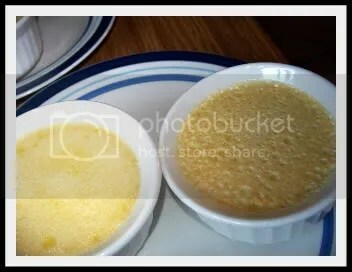 You can obviously serve these when the custard is still warm but we prefer the chill of the set custard and the warmth of the sugar topping. The best part is cracking the sugar top with a spoon after it’s set fully and still warm, then digging out a spoonful of that silky, not-too-sweet but utterly rich and sinful custard and letting it melt on your tongue. It is orgasmic. 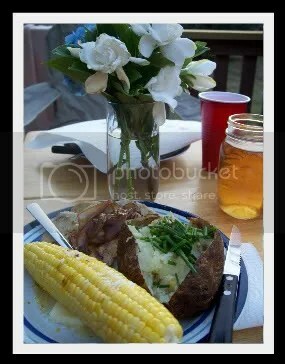 This entry was posted in Cooking, Food and tagged Cooking, Corn, Creme brulee, Food, Pork chops, Potato, Supper, White chocolate by Kate. Bookmark the permalink. your menu is making me hungry!!! it looks great! thanks for stopping by my blog kate, i was an army brat when we lived in ky it was on base at fort knox. we’re did you live?? have a nice trip back!! I’ll be visiting your blog often, dear. I was born in Lexington and have lived in Paris half my life (all of it, if you don’t count the years I’ve been in GA for school). Thanks for the well-wishes!